The Quadra is great for replacing generic globes or clouds with a little more style. The triplex casing, (this means that the glass is hand-dipped three times and hardened three times) insures an even, luminous appearance. You can't see the base from most angles due to its elegant italian design. 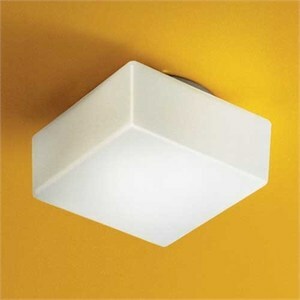 One of our most popular ceiling fixtures. Bulbs: incandescent (not included). White epoxy painted body. Glass held to fixture with hidden screws. Dimensions: 7" W x 7" D x 4" H or 8.5" W x 8.5" D x 4" H.